Morgan James Publishing, 9781630476489, 176pp. "Never Drink Coffee During A Business Meeting" grabs young businesswomen by their stilettos and launches them on a journey of caution and self-promotion. "Never Drink Coffee During A Business Meeting" describes how one woman successfully shattered her own glass ceilings by packing her Coach briefcase with the wit and wisdom of the powerful women she met on her way to the top. 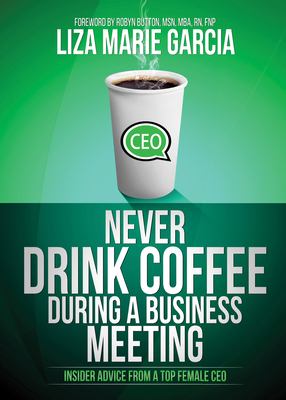 "Never Drink Coffee During A Business Meeting" examines the state of affairs of women in business today and offers remedy to the anti-female, male-dominated culture that still prevails. It is packed with gems of advice and savvy mentoring shared by the CEO-author. Liza Marie Garcia is the CEO of Enterprise Communication Services, an all-woman owned and operated, Professional Services to IT company located in Tampa, Florida. Her first venture, Byrne Integrated Communications, was one of the very first telecommunication services firm in the US with offices in Seattle and Portland. Garcia employs her extensive Fortune 100/500 corporate experience to provide a Zero Impact experience to her clients during their technology upgrades. Garcia sits on the Board of Directors for Little Light of Mine, a foundation providing photography services to children facing life-threating illness. She is an active member of the International CEO think tank group, Vistage in Tampa Florida."